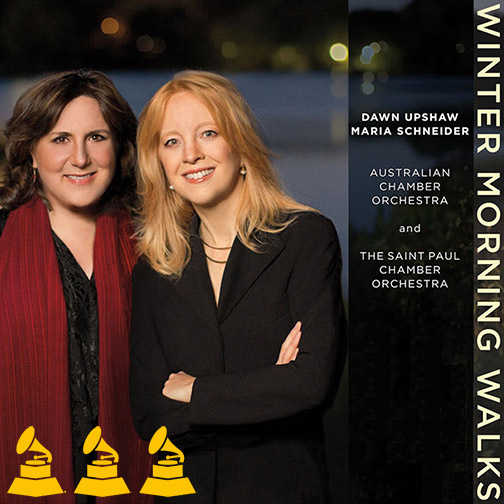 GRAMMY WINNER – Maria Schneider – Best Contemporary Classical Composition, “Winter Morning Walks"
"I regard this album as the most important set of song cycles since Andre Previn's 'Honey and Rue' and Peter Lieberson's 'Neruda Songs–and that is exceptionally high praise ... This is a phenomenal recording. Enough said." "Lyrical, flowing, intimately expressive, with all the elements of words, music, voice and instruments in a seamless blend, this is music to fall in love with the first time — then immediately want to hear again. " – NPR's "ALL SONGS CONSIDERED"
"[Winter Morning Walks] is a sterling standard for American art song." "CARLOS DRUMMOND DE ANDRADE STORIES"
Christopher Moore, principal and low register pianist (prepared piano) on "When I Switched on a Light"